Although it's now officially Spring, it was so cold in March that I found it really difficult to focus on the new season. In truth, I was more interested in the Autumn 2018 looks presented in the Fashion Weeks - my favourite shows were CHANEL, SAINT LAURENT and ALEXANDER WANG. In early March, Karl Lagerfeld presented his beautiful CHANEL Autumn/Winter 2018/19 collection at the Grand Palais in Paris. This time, he created a forest scene as a background for clothes in autumnal colours and leafy prints. Bright pink gloves added flashes of colour to black pieces and burnished gold shoes and boots were featured throughout the collection. As usual, there was a perfect beauty look to suit the mood. The theme was light, healthy, glowing but golden and luminous. On their lips and cheeks, the models wore a new product from CHANEL - Rouge Coco Lip Blush, which is actually out on the CHANEL beauty counters now. I have very often used my CHANEL lipsticks as a blusher on my cheeks, to match my lips and I know that this is an old trick used by makeup artists. Now, CHANEL has introduced a dual-purpose product, Rouge Coco Lip Blush, Hydrating Lip and Cheek Sheer Colour. This is made in a gel formula and has a light-weight texture. The models at the CHANEL show were wearing Tender Rose, a rose pink, which looked good with the autumnal shades and the golden, peachy beauty look. I thought that this would make a welcome change in September, as I have recently been wearing flame red or plum lipsticks for Autumn/Winter. 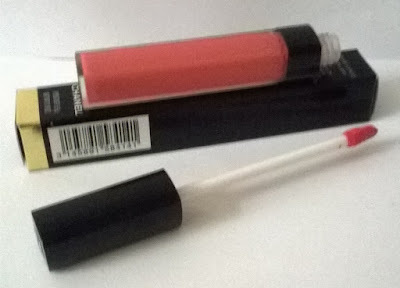 I went to the CHANEL beauty counter at Boots and tried CHANEL Rouge Coco Lip Blush in Tender Rose. I followed CHANEL's advice and used the tip of the applicator for the upper lip and the flat part for the lower lip. The result was a soft, subtle, matte look and the colour was lovely - a medium pink, not too pale but not too deep. Rouge Coco Lip Blush contains natural jojoba, sunflower, and mimosa waxes plus a natural coconut oil derivative and I felt that these ingredients were moisturising and softening my lips, as intended. Next, I applied a dot to each cheek and I was pleased with the light, healthy blush effect. CHANEL recommend applying 1 - 3 dots, to achieve the desired intensity. I really like this product. As there's been a very attractive campaign for it, starring Lily-Rose Depp, it's likely to be a fast seller, so I decided to buy it now. I have promised myself that I will put it away safely and save it for Autumn. After all, I haven't even started wearing my new Spring lip gloss yet - Rouge Coco Gloss in Poppea (794)!! !